Image by TM – the crocheteer! 9. my lovely kitchen china lamp! Since flickr don’t allow me to have more than 200 pictures (feel free to buy me a proaccount if you want! 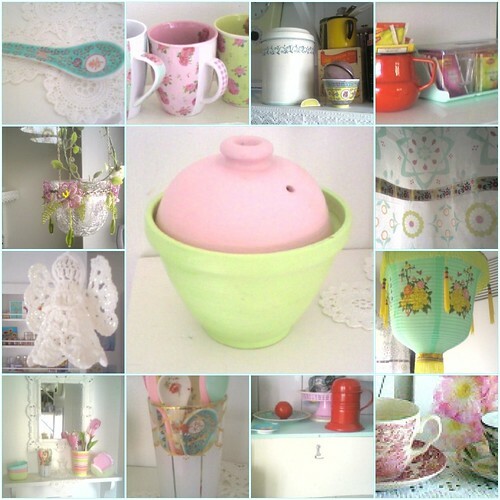 ), I have here compressed some of my kitchen pictures. Please forgive me if you had any of these as favourites before and I now deleted them. This diecast Dinky was produced by Meccano Ltd. (Liverpool, UK) between 1956 and 1969. Because the toy shown in this photo has silver spun chrome wheel hubs and ridged tires, it was probably manufactured in the 1960s. As best I can tell, the versions of this VW produced in the 1950s had painted ridged wheel hubs and smooth tires. The conical-head rivets attaching the baseplate to the diecast body also suggest that it was made in the 60s. 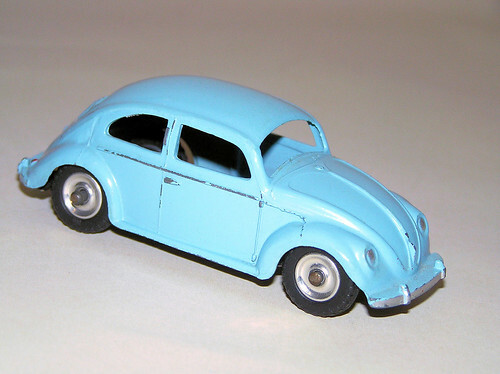 The specific Beetle that this toy represents was built by Volkswagen between 1953 and 1957, consistent with the fact that the toy was introduced in 1956. The car’s production year can be narrowed to this range because the toy has a rear window (not visible in this photo) that is Meccano’s best effort to represent an undivided oval window. Undivided oval rear windows first appeared in Beetles in the 1953 model year; in 1952 and earlier years, the oval was divided in half vertically down the middle. And 1957 was the last year that the oval rear window was used; in 1958 and later model years, the Beetle’s rear window had a much larger rectangular shape. One interesting feature of this toy is the narrow vertical rectangular protrusion that is on the pillar in front of the rear side window. (On this particular toy, the paint has been worn off, so that the protrusion shows up as a small strip of bare metal.) That protrusion is Meccano’s exaggerated attempt to represent the car’s semaphore right turn signal (there is a comparable one for left turns on the other side of the car). When the driver signaled a turn, the appropriate semaphore would pop out perpendicular to the side of the car. In the European market, Beetles had such semaphore turn signals (instead of blinkers in their tail-lights and on their front fenders) from the car’s introduction in Germany in 1938 until after 1960. So those semaphores would be consistent with UK Beetles during the 1953-57 time period derived in the previous paragraph. However, Beetles built for export to the U.S. had such semaphore turn signals only through the 1955 model year. Beginning in 1956, the U.S.-import Beetle had turn signals consisting of blinkers in the tail-lights and mounted on the front fenders. So if this toy were viewed as representing a U.S. Beetle, the presence of the semaphore would mean that it is representing a car manufactured by VW for export during a narrower time window, between 1953 and 1955. The Volkswagen Beetle (or, more formally, the VW "Type 1") was developed in Germany by Ferdinand Porsche with the support of Adolph Hitler, the intention being to develop an inexpensive vehicle for the German mass market. The first 44 pre-production prototypes of the car that we now distinctly recognize as the Beetle were produced in 1938, with an air-cooled rear-mounted 985 cc horizontally-opposed 4-cylinder engine capable of 30 hp. Although they were commonly referred to as the Volkswagen ("People’s Car"), their formal name during WWII was the KdF-Wagen (Kraft durch Freude Wagen, or "Strength through Joy Car", a Nazi slogan). A brand new plant was built to produce these cars, but its focus during the War was on German military vehicles until it was largely destroyed by Allied bombing. Following the War, under British military oversight, production of civilian Volkswagens at the plant resumed in 1945. The first Type 1 (Beetle) formally imported into the U.S. arrived in 1949, and the first sold in the UK was purchased in 1953. By 1967, the engine — still an air-cooled, rear-mounted flat-4 — had grown to 1600 cc and generated 53 hp. Production of the original Type 1 Beetles in Germany ceased at the end of the 1979 model year, as German VW production switched entirely to other, more modern VW models. Production continued at manufacturing facilities in Central and South America, where demand was still strong, until the last facilty in Mexico finally shut down in 2003. By that time, a total of over 21 million VW Beetles had been sold world-wide over a 65-year production run. There are a lot of Beetle enthusiasts around, and I guess that I’m more or less one of them. I got my first Beetle in 1961; my second was a 1967, which I drove for 35 years. One kind of bonds with a car over a time frame like that. Nevertheless, if I were somehow given the opportunity to buy a brand new 1967 VW today — all nostalgia aside — I would have to turn that opportunity down. They were not safe cars, certainly not by today’s standards. For one thing — since the engine was in the rear — the only things between the Beetle driver and the on-coming traffic were: 1) a front bumper that was quite flimsy (at least until the bumpers were strengthened in 1968); 2) trunk space; and 3) the gas tank, which was just on the other side of the firewall from the driver, at about knee height. A Beetle driver of the 1950s and 60s involved in a head-on collision with one of the large, heavy cars that roamed the American highways in that era could well have gotten converted into toasted dead meat. For another thing, the Beetle was light and narrow in width. It could be unsettling to be hit broadside by a gust of wind and be blown almost into the adjacent lane of traffic. This seemed to be a particular problem with the 1961 model I drove.